As Action Park prepares to bring back its notorious Cannonball Loop, a look back at New Jersey’s bone-cracking house of fun. Labor Day, 1976: Eugene Mulvihill, developer of the Vernon Valley–Great Gorge ski area in northern New Jersey, opens a pair of 2,700-foot “Alpine Slides” to keep the resort going in the off-season. Patrons head down on sledlike carts, with skids and small wheels, controlled by a joystick. May 26, 1978: The resort area expands: Action Park opens at the base of the mountain. The Alpine Slide is soon joined by the Wave Pool, where 20-minute cycles of white water alternate with short periods of calm. Lifeguards constantly have to haul floundering patrons out of the water. 1982: The park has more than 50 rides, and its ads are ubiquitous on local New York TV. Around the time Mulvihill tells a Jersey paper that his park is “gonna be better than Disney World,” a 15-year-old drowns in the Wave Pool. A week later, a 27-year-old is electrocuted on a ride called the Kayak Experience. November 1984: Mulvihill pleads guilty to setting up a fake company in the Cayman Islands to “insure” the park. He cops a plea, gets three years’ probation, and he and the company pay almost $300,000 in fines. He’s supposed to sell the resort but manages to hang on to it. Summer 1985: The Cannonball Loop, reputedly designed by Mulvihill on a napkin, opens. The notorious slide (pictured) is about 100 feet high, and Mulvihill’s son Andy is the first to ride it, wearing hockey pads. 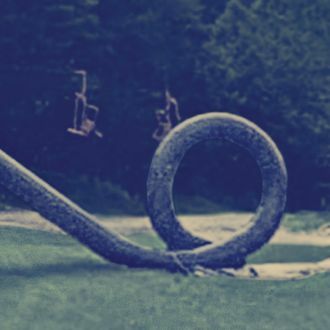 (Andy Fiori, a regular park visitor, recalls a rumor that “they sent a dummy down [to test it], and it came out with no arm.”) Riders tend to get stuck at the bottom of the loop, and there’s no escape hatch. According to some reports, New Jersey’s regulators ordered it closed after just a month. But Bill Benneyan, who runs the park today, says that “in reality, it operated off and on for quite a while.” The summer’s tally: 110 reported injured, including 10 fractures and 45 head injuries. Summer 1986: Evan Schuman, the courts-and-investigations reporter for the New Jersey Herald, finds that workers as young as 14, hired to do lawn care and the like, have been informally and illegally promoted and are running the rides. 1995: After years of bad press, lawsuits, and citations for safety violations, the park goes bankrupt and closes. A resort company, Intrawest, buys it three years later. 1998: Intrawest reopens the resort under the name Mountain Creek Waterpark. 2010: Intrawest sells the park to Crystal Golf Resort — which is owned by the Mulvihills. 2012: Gene Mulvihill dies. He’s eulogized as one of the great economic forces of North Jersey. August 2013: Porges makes a short documentary about Action Park, The Most Insane Amusement Park Ever, and releases it on Mashable. It has been viewed 962,000 times. June 14, 2014: Capitalizing on nostalgia, Andy Mulvihill restores the name Action Park and reopens it with far safer rides. The big hit is the 100-foot-tall Zero G water slide. The Alpine Slide is now the Alpine Mountain Coaster, its carts on tracks so they can’t fly off. Spring 2015: A new Cannonball Loop is on the way! It’ll be called the Sky Caliber, with a 90-foot drop, and will open in 2016. “We found someone that has the same vision that actually figured out how to do it right,” Benneyan tells nj.com.